You will need a mini heart-shaped cookie cutter for this recipe. Slice strawberries vertically into 1/2 inch thick pieces. Lay flat on a cutting board and press each one with your mini heart-shaped cookie cutter. Set aside the hearts and discard the extra pieces. 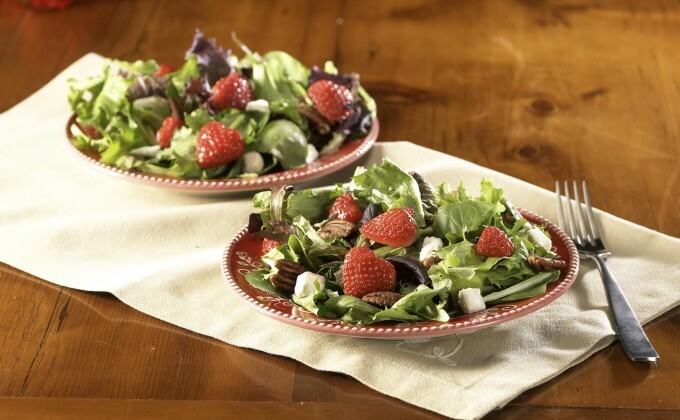 In a temp-tations® 3.5 quart serving bowl, combine spring mix, feta cheese, toasted pecans and strawberry hearts. Place oil, strawberry jam, vinegar, poppy seeds, salt and mustard in a bowl. Whisk until smooth. You can also use a blender for this step.